Alexandria, VA (February 7, 2019) – Idealliance, working closely with Amcor Group GmbH and one of their closest packaging customers during a G7® Training and Master Qualification in Rinteln, Germany masterfully performed in achieving G7 Master Qualification on offset and rotogravure as well as training staff from across Europe as G7 Experts. Amcor Limited is one of the largest packaging service providers in the world serving some of the largest brands in the world, utilizing a multitude of printing processes across the world. “Working with Jens Pilzecker and the amazing staff at Amcor from across Europe was a wonderful experience. Amcor is a world-class company. In the Amcor offices and manufacturing facilities they have the Amcor values all over the place-on the walls, computer screen savers and signs, which is called the Amcor Way, as reminders of who they are and what they stand for. What struck me the most, is that a company of this size truly acting out their values in everything they do and in with every person we encountered throughout Amcor. You could feel that this organization’s values, discipline, principles and pride in their work are woven into every employee. Their kindness was incredible, so was their knowledge. Working with their design group, pre-press, plate-making, cylinder manufacturing, standards, and operations team is the core value of bringing everyone together to “speak the same color language”. With everyone in the same room, talking about the production of a product start to finish in order to achieve the brand quality requirements set before them allowed everyone to see the important roles each plays in the production process. Every night we stayed late because Amcor is driven by flawless execution, curiosity in learning, and attention to detail, which are all extremely important in the value of education and innovation, which go hand-in-hand in driving organizations.” said Idealliance CEO Tim Baechle. Idealliance, a global think tank, with 12 offices strategically located throughout the world has developed some of the world’s most leading ISO standards and specifications. With G7, also known as Near-Neutral, being revised into ISO Standard 12647-2, G7 is continuing to grow at an incredible pace around the world. What is G7 Master Facility Qualification? Print service providers of all types know that a measurable, predictable, and uniform color management process provides significant immeasurable business advantages. For printers to make money, orders must be turned around quickly, they must be consistent, and they must be predictable, especially when you can significantly drive down waste and massively increase profitability. Whether the process is: offset, flexo, gravure, screen, wide format, digital (toner and inkjet), industrial inkjet, or dye-sublimation, G7 works on any printing process. 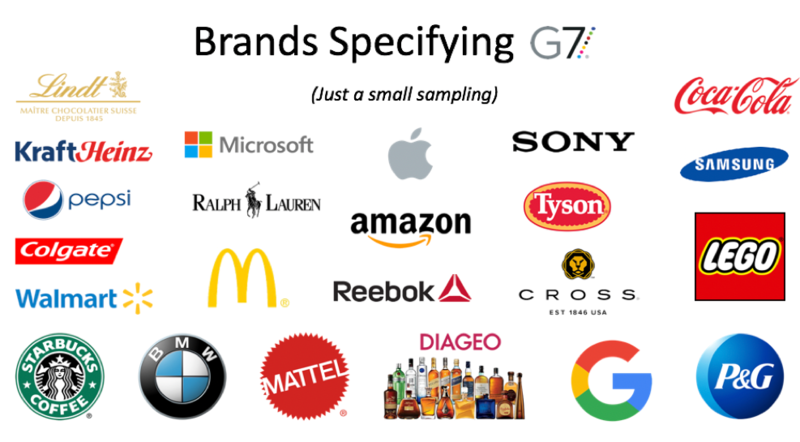 For information on G7 and BrandQ training programs, contact Jordan Gorski, Vice President of Global Certification Programs at (703) 837-1096 or jgorski@idealliance.org. Idealliance, a global think tank, is a non-profit graphic communications industry organization with 12 strategically located offices around the world. Idealliance serves brands, OEMs, service providers in print and packaging, content & media creators, fulfillment, mail delivery, creative agencies/teams, material suppliers, and innovators & developers worldwide. We do our work through ISO Standards Innovation, Print and Digital Workflows & Technologies Development & Integration, Technical Research & Industry Insights, Certification, Training, Brand & Facility Auditing Programs and serves as a Global Super Connector for brands, service providers, & OEMs throughout the world. Our specifications have transformed the graphic communications industry by defining production workflows for color (GRACoL®, SWOP®, XCMYK™, G7®, BrandQ®), content management (PRISM®), mail supply (Mail.dat®, Mail.XML™), and paper (papiNet®). Idealliance is the world’s foremost certifying body for competencies, systems, materials and facilities, and Idealliance, a Liaison ‘A’ to ISO TC130, is one of the world’s largest contributors and developers of ISO standards. Join us in the transformation of our industry.